Many cats are not fond of being moved around without their consent. Sure, some love to go for walks and are ok with a leash and harness and some other cats like car rides, but those felines are few and far between. Cats, unlike dogs, tend to prefer not being tethered or crated for any length of time. When it is time to take a cat to the vet or moving, the carrier they travel in must be sturdy, the right size, and easy for us to handle. They must also be the “right” type for your cat. If you have a laid back cat or one who is too nervous to fight, a mesh cat carrier may be fine. If you have a bruiser of a cat who will try to escape then a hard-sided plastic carrier with a good lock on the gate and held together well is crucial. I’ve had both types of cats and one that really like to be carried around in my arms or in a bag. Finding the right carrier can be tough but when you do find it, it’s a lifesaver. 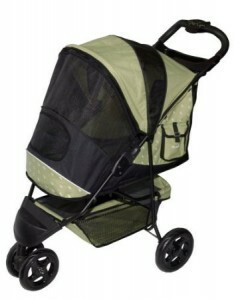 While this is not a typical carrier, this stroller is great for when you are walking distance to the vet or live in a city and don’t have a car. The stroller can hold a pet that weighs up to 45 pounds and has a fleece pad for comfort and a mesh zippered enclosure to allow airflow but also keep your pet from getting away. The shock absorbers also make the trip smooth for your furry buddy. This is a great choice for calm cats and those of us who aren’t able to carry a cat carrier or don’t like the way carriers tend to jostle and rock with our gaits. Stylish and perfect for airlines, this carrier weighs 4 pounds and is made of nylon fabric. It’s perfect for small dogs and cats. The dual mesh on the windows helps prevent your cat from trying to escape and lets air flow in easily. The outer shell is also water resistant which is great if you get caught in a downpour from the airport to a taxi. It comes with a shoulder strap which makes walking with your cat easier on you and them. It’s strong enough to handle a nervous cat who may try to push and claw a little at the sides. The Bergan carrier is also an airline approved carrier that offers comfort for your pet with a fleece travel bed, lots of ventilation with its mesh windows, and a shoulder strap for easy carrying. The carrier is sturdy and well-made. 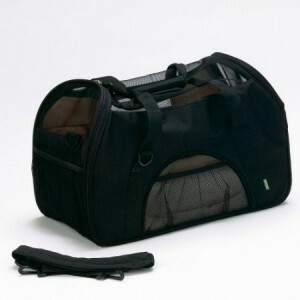 The carrier has a front zipped opening which might be tough if you have a cat that isn’t a fan of traveling but maybe with some treats it will work perfectly. It also comes in several colors. Sherpa has been making this model of pet carriers for years. My cats each have one and the Sherpa carriers have lasted over 6 years now. My cats go to the vet twice a year since they are seniors and have traveled on flights from the east coast to the west. The Sherpa carriers are airline approved, sturdy, keep their shape well, and well ventilated. The top zippered entry is great for cats who don’t like being nudged into the side opening and the shoulder strap makes it easy to walk without jostling the cat around. There are also two storage pockets for keeping health certificates or anything else you need for your pet when you travel. It’s strong enough for a nervous cat who desperately wants out and fits under the seat during air travel. This carrier is probably the one many of us recognize. 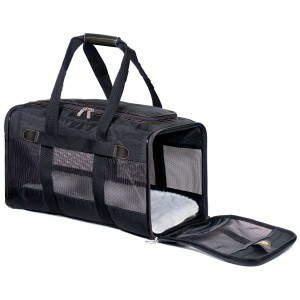 It’s a durable, heavy duty carrier that meets airline policies and is great for trips to the vet. With wired windows and a gate with a sturdy lock, your cat will be safe and have plenty of airflow. 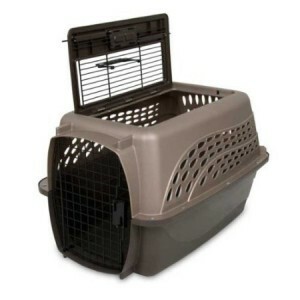 The Vari Kennel is great for the active cat who is persisted in trying to get out of the carrier. It’s also sturdy for heavy cats. If taking a road trip, the carrier can come apart and the bottom half can become a bed with a fleece liner or blanket when at your destination. 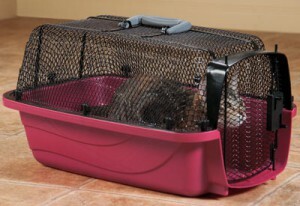 Great for the cats who are adamant about not staying in the carrier. 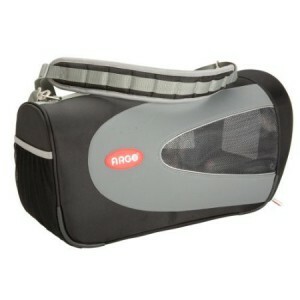 The open mesh design can help cats feel not as trapped in this carrier. The plastic is molded and tough, easy to clean, and has a dual spring latch to ensure that your cat doesn’t accidentally escape during travel. It’s airline approved and great for the cat that is curious about EVERYTHING. It’s securely built and easy to clean. 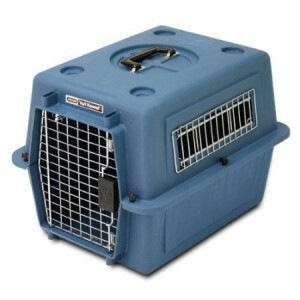 Two door carrier by Petmate is great for those of us who own cats that give us a little battle when it’s time to travel. The top opening means that your cat can be lifted and placed inside the carrier rather than nudged through the side door. There is plenty of ventilation, and it’s easy to clean. The steel front latch ensures that your cat will be safe and unable to escape. There’s even a water cup included with this carrier for long trips. If you have a favorite cat carrier or would like to share your experience with one of the crates shown here, please let us know. cat opened catches on its carrier just as we arrived at the vets for his vaccination appointment, escaped and ran off.He was frightened by traffic etc. I had him in my arms and cars terrified him and he jumped again. Same thing happened him with my son. We – son,daughter and I ,spent ages searching before going home without him. I intended going back up at dawn to find him, but next morning my son let him in the kitchen door – he had travelled several miles and found his own way home to us.